Why This Should be The Garden Office for You & Your home as incorporated into the Platinum ‘Fleet Contemporary’ Garden Home Office are full-length double doors and windows which ARE double glazed for security and comfort. These help to keep these offices warmer in the winter and cooler in the summer. The style of these windows reflects the modern look of these bespoke garden rooms and the natural light which pours into the building make it a joy to be working from home. Two top hung fanlight windows included for ventilation. Fully pressure treatment is included as standard – this treatment has a design life of 15 years against rotting – and 2 different types of claddings, for the ultimate home office. These ‘Fleet Contemporary’ offices incorporate some of the best materials available to ensure that these bespoke garden rooms are built for long life. With the double glazing, the superb extra tall eaves height, lining & insulation and the long-lasting pressure treated timber used the quality and thought shown shines through. 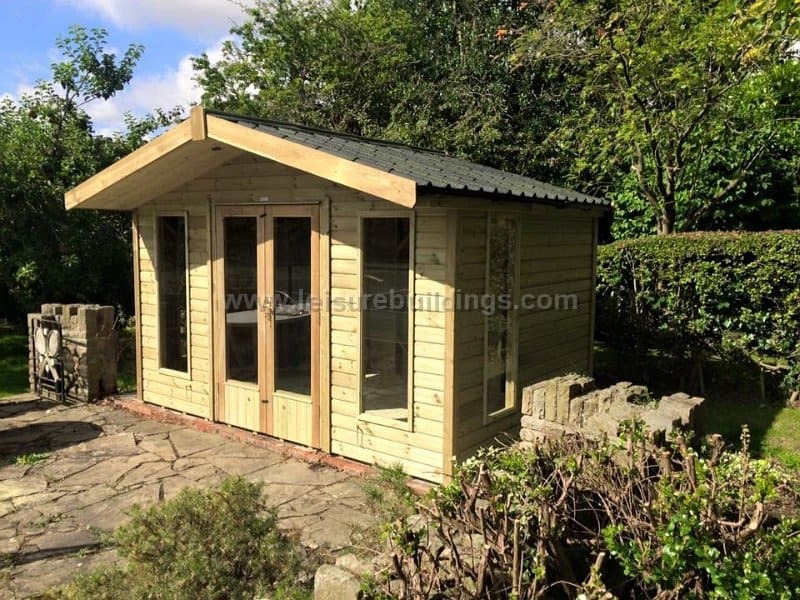 Add in the very stylish and attractive 2ft roof canopy as standard you can be sure that this garden office will grace any garden, particularly yours. The ‘Fleet Contemporary’ garden home offices are built on a superb 75x35mm (2¾” x 1½”) and are plywood lined for extra strength. The roofs on these ‘Fleet Contemporary’ garden offices are made from stained T& G boards covered in high-quality heavy duty green mineral felt with an option for felt shingle tiles, an Onduville tile effect roof, corrugated Online roofing or Novislate. The thick superb floor is also pressure treated using Tanalith meaning you can expect a very long life with these superb garden offices. 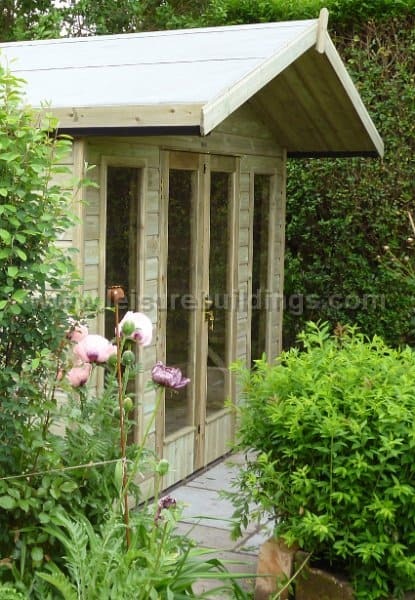 Whilst you can see examples of these garden offices on this site and in our photo gallery the beauty of these buildings is that they are made to suit you. Whether you want a different size, extra or fewer windows or doors a partition inside then this can be done. There is no end to how much these garden offices can be bespoke so even if you think it can’t be done then please ask. With the full lining and insulation included as a standard your new garden office will take on a new role. Being warmer in the winter and cooler in the summer it will become a pleasure to be in. Your working day will never be the same again – in a good way. These garden offices INCLUDE fully double glazed doors and windows so with the insulation you will be protected from all ‘Mother Nature’ throws at you. It’s always good to look beyond the web page, leaflet or shiny brochure so it’s a good idea to investigate further. 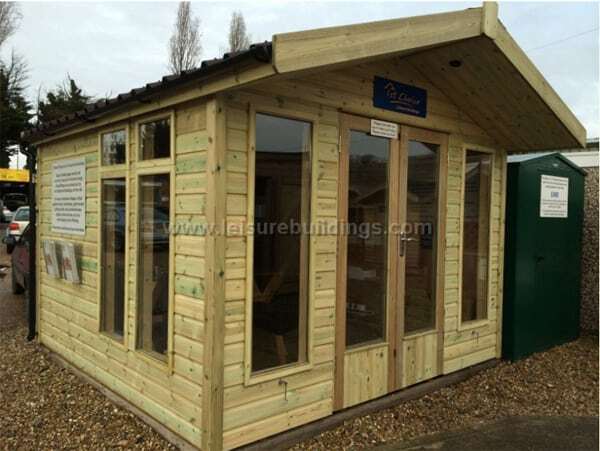 We have garden rooms display sites near Woking and Farnham in Surrey and we do have examples of these Platinum garden buildings on display so you examine the quality and pedigree of the manufacturer. You could also take a look at this independent feedback (opens new page) to see what previous customers are saying about them. You should be pleasantly surprised. Size: The standard garden office sizes are 2.4m x 1.8m (8′ x 6′) – up to 12′ x 12′ as standard, but larger bespoke garden offices can be made so please ask if you need any other size or layout. 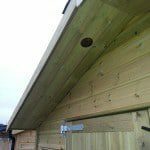 Cladding: 19mm (15-16mm finished thickness) tanalised T&G OR 22mm (20mm finished thickness) T&G Loglap – (Redwood deal not the cheaper inferior whitewood) AND lined with plywood and bitumen paper between the home office framing and cladding for extra strength and damp-proofness. Framing: These garden rooms and home offices have a superb 75x38mm (2¾” x 1½”) on all buildings. All have sturdy diagonal bracing in all corners for extra stability. Effectively thicker in corners. Roofs: 16mm (12mm finished thickness) stained timber covered with heavy duty green mineral felt. Option for felt shingle tiles, Ondulvilla tile effect roof, Onduline roof sheets or Novislate roof. Standard roof overhang is 24″. (NO chipboard, plywood, OSB, sterling board or sheet materials as these are unsuitable for outdoor use.) Vents added to the underside of the roof to allow for free flow of air. Doors: Double Doors 4′ 0″ wide x 5′ 10″ (106 x 178cm) high on all buildings. Glazed with toughened glass. FULLY Double Glazed as standard. Windows: 18″ wide x 65″ high (46 x 165cm) joinery made. Glazed with toughened glass. FULLY Double Glazed as standard. Number varies with size of home office. Two top hung fanlight opening windows included as standard. No windows next to doors on 7ft wide sides. Treatment: Pressure treated timber garden rooms use the renowned Tanalith treatment designed to last at least 15 years against rotting. Although the timber is protected against rotting it’s important that you apply a coat of waterproof treatment within 3 months of delivery to ensure the fullest life for your new building. Installation: All our wooden home offices are installed FREE of charge in your garden, provided you provide a solid level concrete or paving slab base or timber decked area. Optionally, we have an option for building a timber subframe (some areas) for you. These garden offices are assembled using coach screws for ease of taking it down again if you decide to move. 10% discount for delivery only (self assembly). Insulation: To make best use of these buildings as garden home offices or all round year summerhouses these buildings are lined and insulated as standard with plywood, helping to keep them cool in summer and warmer in winter. Option for T&G boards. Support UK: These Platinum Garden Rooms are made in the UK by experienced craftsmen. You can support our British workers. Optional Extras: Double doors, extra windows, 3¾” x 1¾” framing, guttering, extra height. Sizes: Unless specified as finished size then sizes quoted are before machining which reduces the size quoted by about 3mm. Overall sizes of the Contemporary Garden Home Office are nominal METRIC sizes which are slightly smaller than imperial. Beware of other home offices with before machining measurements. Always check.